Hello! Remember that online store I was talking about that a friend (Julie) was starting?? Well she is now open!! Go check it out, Paper and Such! Lots of pretty paper,ribbon and embellisments and of course stamps!! She has asked me to be on her DT and of course I said Yes!! There is going to be a challenge blog to go along with the store. The challenges will be on the 2nd & 4th Tuesdays of the month and the prize will be $10 in store credit!! And since this is the 2nd Tues of the month that means it's time for our 1st challenge!! Since today is Julie's Birthday(Happy Birthday Julie!!!) she has choosen the theme of Birthdays for our first challenge, you can find it here. You have till the 21st at midnight to play along, hope to see you there!! 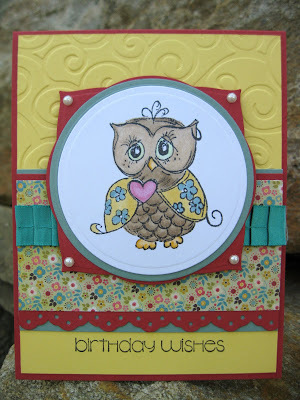 The adorable owl I used on my card is by Kaisercraft and can be found in the store! The pretty MME paper and the May Arts ribbon are also available in the store. Thanks for stopping by! Love the new profile! Gorgeous card, so full of life and color!!!! Lovely card Janice! Isn't that owl too adorable? Thank you for joining me on my new adventure. Hoot hoot, so cute! Went and checked out the shop, and it is adorable. I wish Julie the best of luck and a very happy birthday! Pure yummy-ness Janice! That paper is scrumptious... off to check out the store! Oh and congrats on being on the DT! You go girl! Beautiful card! Lovely coloring, layering and embossing!